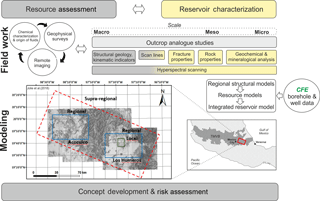 Outcrop analogue study to determine reservoir properties of the Los Humeros and Acoculco geothermal fields, Mexico Outcrop analogue study to determine reservoir properties of the Los Humeros Leandra M. Weydt et al. The Los Humeros geothermal system is steam dominated and currently under exploration with 65 wells (23 producing). Having temperatures above 380 ∘C, the system is characterized as a super hot geothermal system (SHGS). The development of such systems is still challenging due to the high temperatures and aggressive reservoir fluids which lead to corrosion and scaling problems. The geothermal system in Acoculco (Puebla, Mexico; so far only explored via two exploration wells) is characterized by temperatures of approximately 300 ∘C at a depth of about 2 km. In both wells no geothermal fluids were found, even though a well-developed fracture network exists. Therefore, it is planned to develop an enhanced geothermal system (EGS). For better reservoir understanding and prospective modeling, extensive geological, geochemical, geophysical and technical investigations are performed within the scope of the GEMex project. Outcrop analogue studies have been carried out in order to identify the main fracture pattern, geometry and distribution of geological units in the area and to characterize all key units from the basement to the cap rock regarding petro- and thermo-physical rock properties and mineralogy. 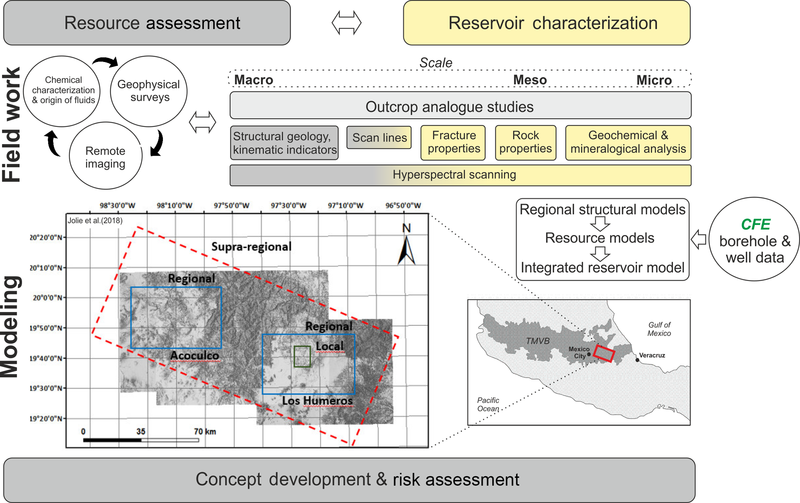 Ongoing investigations aim to identify geological and structural heterogeneities on different scales to enable a more reliable prediction of reservoir properties. Beside geological investigations, physical properties of the reservoir fluids are determined to improve the understanding of the hydrochemical processes in the reservoir and the fluid-rock interactions, which affect the reservoir rock properties. Weydt, L. M., Bär, K., Colombero, C., Comina, C., Deb, P., Lepillier, B., Mandrone, G., Milsch, H., Rochelle, C. A., Vagnon, F., and Sass, I.: Outcrop analogue study to determine reservoir properties of the Los Humeros and Acoculco geothermal fields, Mexico, Adv. Geosci., 45, 281-287, https://doi.org/10.5194/adgeo-45-281-2018, 2018. Figure 1Simplified work flow within the GEMex project. Unconventional geothermal systems like EGS or high temperature geothermal systems (>350 ∘C) have the worldwide largest potential for deep geothermal energy utilization (Huenges, 2010) and have raised the interest of the industry and scientific community in the last decades. Several issues like corrosion and scaling effects have been encountered in the past while trying to exploit and operate unconventional or hot geothermal reservoirs with supercritical conditions (Reinsch et al., 2017). Comprehensive and detailed exploration is needed to improve reservoir understanding and to enable a better reservoir modelling, which helps to handle the supercritical fluid conditions in the reservoir. Therefore, the GEMex project (EU-H2020, GA Nr. 727550) focuses on the development of (hot) EGS and the investigation of high-temperature geothermal fields (>350 ∘C) on two sites in the northeastern part of the Trans-Mexican Volcanic Belt (TMVB), the Acoculco and Los Humeros caldera complexes (Puebla). 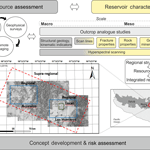 The project comprises a multidisciplinary approach in order to find new transferable exploration approaches and technologies based on three milestones which are (1) resource assessment, (2) reservoir characterization and (3) concepts for site development (Jolie et al., 2018, Fig. 1). Outcrop analogue studies were conducted to investigate fracture patterns, geometry and dimensions , as well as to characterize the key lithologies with regard to thermo- and petrophysical rock properties and mineralogy at different scales (outcrop, rock sample, thin section). Furthermore, the project comprises a complex work flow for the compilation and integration of extensive data sets from different scientific disciplines. The resulting data and models of all work groups will be combined in integrated reservoir models at a local, regional and superregional scale. This paper presents first results of the `reservoir characterization' work group as part of milestone 2 and gives an overview of the project's work flow and methods applied in the field and laboratory as well as the subsequent processing of the data sets generated. It should serve as an example for upcoming projects and help to develop concepts for the characterization of high-temperature unconventional geothermal fields. The Acoculco and Los Humeros caldera complexes are located in the northeastern part of the TMVB, 125 and 180 km east of Mexico City, respectively. The Acoculco caldera complex has a 20×18 km asymmetric structure (Avellán et al., 2017) and lies within the older and larger Tulancingo caldera (Pfeiffer et al., 2014). The Acocuclo caldera comprises Pliocene and Pleistocene calcalkaline volcanic rocks resulting from three main volcanic periods in the area (López-Hernández et al., 2009). The first and second period are related to the collapse of the Tulancingo caldera (3.0–2.7 Ma) and the Acoculco caldera (1.7–0.24 Ma) producing mainly dacitic to rhyodacitic lavas and rhyolitic domes and andesitic ingnimbrites, respectively. A third episode (1.8–0.2 Ma) is related to monogenetic volcanism without a caldera collapse (López-Hernández et al., 2009). Figure 2Schematic work flow within the “Reservoir characterization” work group using the example of the El Dorado mine in Las Minas (d) with view on the footwall of the present fault (photo from Maximilian Bech). The quarry exposes exoskarn in many variations. A lot of calcium-rich minerals were found which indicates the close proximity to the host rock (limestone). Outcrop analysis included detailed investigation of kinematic indicators, mineralogy (a) and the main fracture pattern (e, f). Representative rock samples were taken for petrophysical rock measurements (b), geochemical and thin section analysis. (c) shows skarn with clinopyroxene, quartz, plagioclase and anortite (photo from Caterina Bianco). The younger Los Humeros caldera comprises Pleistocene to Holocene basaltic andesite-rhyolite volcanic rocks and has a 21×15 km irregular circular shape (Carrasco-Núñez et al., 2018). The emplacement of the Los Humeros caldera was associated with two main caldera-forming eruptions and multiple voluminous plinian eruptions as well as alternating episodes of dacitic and rhyodacitic dome-forming eruptions (Carrasco-Núñez et al., 2017a). Thick sequences of hornblende andesites and basaltic lava flows (10.5 Ma, Cuyoaco and Alseseca andesites), Toba Humeros vitric tuffs and Teziutlán augite andesites (5–1.55 Ma; Norini et al., 2015 and references herein) form the geothermal reservoir in the subsurface of the Los Humeros geothermal system (Carrasco-Núñez et al., 2018). Ignimbrites (Xáltipan ignimbrite at ∼160 ka and Zaragoza ignimbrite at ∼69 ka; Carrasco-Núñez et al., 2017b), tuffs, ash fall deposits and diverse pyroclastic flows form the cap rock of the reservoir, which is overlain by Holocene to recent basalt lava flows. The volcanic rocks of the Acoculco and Los Humeros geothermal fields were emplaced on intensively folded Mesozoic sedimentary rocks belonging to the Sierra Madre Oriental (López-Hernández et al., 2009) comprising Jurassic sandstones, shales and hydrocarbon-rich limestones and dolomites overlain by Cretaceous limestones and shales. Granitic and syenitic plutons of Cenozoic age and basaltic dykes intruded into the sedimentary sequences and led to local metamorphism of marble, hornfels and skarn (Ferriz and Mahood, 1984). The Los Humeros geothermal system is steam dominated and exploited and operated by CFE since 1990. About 65 wells have been drilled so far (depths between 1500 and 3100 m), while 23 are still productive (Romo-Jones et al., 2017). Produced power is about 68 MW with a possible total capacity of about 94 MW. Temperatures around 380 ∘C were encountered at depths below 2 km in the northern parts of the caldera complex (Pinti et al., 2017). Up to now, two exploration wells have been drilled in the Acoculco geothermal field, which encountered temperatures of approximately 300 ∘C at a depth of about 2 km (Canet et al., 2015). In both wells no geothermal fluids were found (López-Hernández et al., 2009), even though it was thought that a well-developed fracture network exists in the area. Therefore, it is planned to develop a deep EGS and enhance connections between networks of fractures in order to connect the existing wells to proximal fluid bearing fracture zones (Jolie et al., 2018). Outcrop analogue studies offer a cost-effective opportunity to investigate and correlate facies, diagenetic processes and petrophysical properties from outcrops to the reservoir. The key lithologies and their properties were analyzed on different scales (Fig. 2). Several joint field trips with project partners were conducted. Whenever possible, different groups joined forces to enhance the comparability of results. 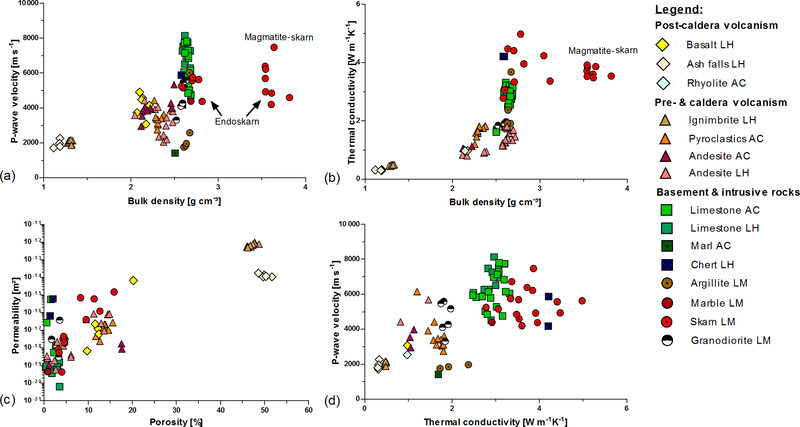 Figure 3Petrophysical properties measured at dry conditions. The Pre-caldera and Caldera group were merged for simplification. For the number of analysed samples please see Table S1. In addition to analysis of outcropping rocks in the vicinity of the active geothermal areas, particular attention was paid to equivalent exhumed systems at Zacatlán (east of Acoculco) and Las Minas (east of Los Humeros), exposing all units from the cap rock to the basement. These “fossil systems” serve as proxies and help to understand fluid flow and mineralization processes in the reservoirs. Relatively little is known about the petro- and thermo-physical rock properties in the study area. Further data are needed for processing and interpreting the geophysical data and for parameterizing reservoir models. In order to create a comprehensive data base, which covers all relevant units from the basement to the cap rock, rock samples were taken from outcrops inside the calderas, in the surrounding areas and from exhumed systems. This is necessary for a large enough data base to upscale and correlate within the reservoir model and identify heterogeneities. Samples are being analyzed for petrophysical (e.g. density, porosity, permeability) and thermophysical properties (thermal conductivity, thermal diffusivity, heat capacity) as well as ultra-sonic wave velocities, electric resistivity and magnetic susceptibility by different partners subsequently to compare and validate different methods. First results of the petrophysical measurements are shown in Fig. 3 and Table S1 (Supplement). Complementary to the laboratory measurements, further ultra sonic wave velocity and electric resistivity measurements were performed directly in the field on sample material of selected outcrops (shallow geophysical surveys, see chapters “Complementary field work” and “Planned investigations on the sample material” in the Supplement). More than 250 rock samples were taken for rock property measurements from about 125 outcrops covering all key lithologies (Fig. S1 in the Supplement). Plugs with diameters from 25 to 64 mm were drilled from the samples and subsequently dried at 105 ∘C for at least 24 h until constant mass was achieved. Samples were analyzed for density, porosity, permeability,thermal conductivity and diffusivity, ultra sonic wave velocity, electrical resistivity and magnetic susceptibility. Whenever possible, all parameters were measured on each plug or rock sample for direct correlation. The rock samples were classified after Norini et al. (2015) and Avellán et al. (2017) into (1) Post-caldera volcanism, (2) Caldera volcanism, (3) Pre-caldera volcanism and (4) Basement and Intrusive rocks. Grain- and bulk density measurements were performed with an AccuPyc 1330 gas pycnometer and a GeoPyc 1360 powder pycnometer (Micromeritics, 1997, 1998). Afterwards porosities were calculated. Density and porosity of large samples which did not fit into the pycnometers were determined using saturation and caliper techniques as per ISRM (1979). Matrix permeability was determined with a column permeameter after Hornung and Aigner (2004). The plugs were measured using at least five air pressure levels ranging from 1 to 5 bar. Measurement accuracy varies from 5 % for high permeable rocks (K>10-14 m2) to 400 % for impermeable rocks (K<10-16 m2) (Bär, 2012). Ultra sonic wave velocity was measured with pulse generators (UKS-D from Geotron-Elektronik, 2011 and Pundit Lab, Proceq, ASTM D2845-08, 2008) comprising point-source transmitter-receiver transducers. Polarized pulses at high voltage in a frequency range from 20 kHz to 1 MHz for the UKS-D and 54 and 250 kHz for the Pundit Lab were generated. 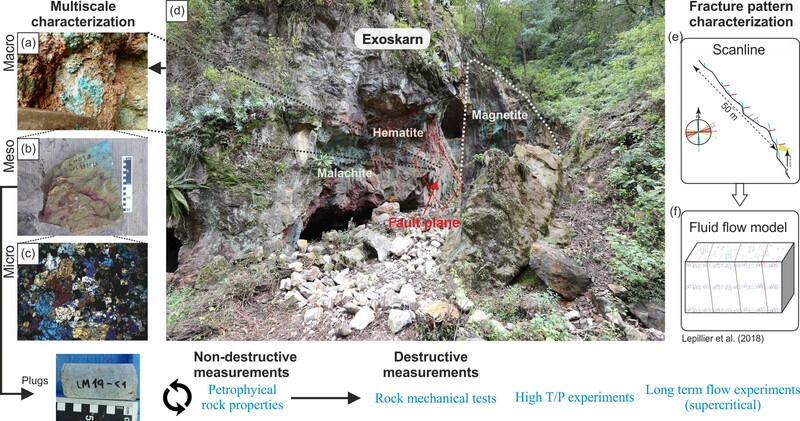 Additional field measurements were also performed on irregular shaped outcrop samples for P-wave velocities. P-wave measurements were performed using the same Pundit Lab. Proceq device along different directions on the sample surfaces in order to identify anisotropy and the effect of fractures. The combined measurement of both P-and S-wave velocity offers the opportunity to retrieve elastic mechanical parameters like Poisson ratio, Young's modulus and G modulus (Mielke et al., 2017). Electric resistivity measurements were carried out with a purpose built square quadrupole after Clement et al. (2011). Electrical resistivity measurements were performed with current injection between two subsequent electrodes and the measurement of the resulting electric potential between the remaining pair of electrodes. Concerning the field samples, the electrical resistivity was estimated from electrical resistivity tomographies performed in the sampling areas. For the determination of thermal conductivity and thermal diffusivity a thermal conductivity scanner was used after Popov et al. (1999, 2016). The measurement accuracy is 3 % (Lippman and Rauen, 2009). Furthermore, a Multi-Sensor Core Logger (MSCL) from GeoTEK (2000) was used for measurements of gamma density, P-wave velocity, magnetic susceptibility and electrical resistivity on whole core samples with a diameter of 60–64 mm. Matrix density was calculated based on attenuation of gamma rays emitted from Cesium-137, while porosity was calculated from the density measurements. The P-wave velocity was measured by calculating the travel time through the core of an ultra-sonic pulse generated and received by. The accuracy is set about 0.2 % depending on core condition (GeoTEK, 2018). Magnetic susceptibility was determined using a Bartington loop sensor with a 5 % calibration accuracy. The field campaigns have shown the geological complexity of the two reservoirs. Composition, extension and distribution of the volcanic sequences are very variable within both sites. Dark grey, massive to slightly porous, aphanetic (basaltic) andesites (Teziutlán andesite) were found north of the Los Humeros caldera, while andesites exposed east and west of the Los Humeros caldera (Cuyoaco and Alseseca andesite) have shown a medium grained, porphyric texture comprising plagioclase and hornblende. The carbonatic basement is intensively folded and faulted by the Laramide orogeny. The most frequently encountered basement facies in the study area are Middle and Upper Cretaceous units (e.g. Orizaba formation) comprising 15 to 60 cm thick beds of massive, mudstones with marl and chert layers (or nodules; both up to 30 cm thick) as well as grey to greenish shales and massive grey limestones without chert (bed thickness ∼1 m and more). Jurassic units were found only in Zacatlán as well as north and northwest of the Los Humeros caldera. We sampled red, altered sandstones and massive, hydrocarbon-rich limestones. Marble/skarn quarries in Las Minas indicate complex fluid-rock reactions in the carbonatic rocks, which led to a range of dissolution/precipitation processes and fracturing. One reason for the complexity of these systems is the overprinting of initial high temperature alteration by lower temperature alteration as the system cooled. Hydrothermal alteration of different intensities can be observed in dykes and fault zones in the outcrops cutting through all key lithologies, which is one of the key processes affecting the petrophysical properties (Fig. S2). Likewise, several different intrusive bodies intruded into the sedimentary basement spread over the Los Humeros area showing intensive alteration (and weathering). Following studies will focus on quantifying the impact of hydrothermal alteration on the aforementioned rock properties. The first petrophysical property results (Fig. 3, Table S1) enable the classification of lithofacies types with distinct properties. The data indicate that Cretaceous units are relatively homogenous throughout the study area with very low matrix permeability (<10-16 m2) and porosity (<5 %); thus geothermal fluid movement must be fracture controlled. Andesite samples are more variable and indicate slight regional trends, which confirm field observations. The skarns show the highest variability in rock properties, explained by their variable mineralogical composition. This was caused by the complex metamorphic processes in the contact zones as well as the type of protolith: carbonate (exoskarn) or igneous rock (endoskarn). The ignimbrites and ash falls can be clearly distinguished from the other units. Results of P- and S-wave and electric resistivity field measurements are in good agreement with lab measurements (Fig. S3). The field campaigns revealed the complexity of the two reservoirs. Detailed outcrop analysis is paramount to characterize and discover heterogeneities within the geological units. Extensive structural analysis serve to characterize the main fracture patterns and to identify fluid pathways. Shallow geophysical measurements help to characterize the field scale rock mechanical behaviour of main fault zones. The results of petrophysical measurements already enable the classification of different lithofacies types with distinct properties. Future investigations will focus on core samples from wells of the Los Humeros geothermal field for direct comparison of outcrop analogues and the reservoir. Hydrothermal alteration of different intensities can be observed in outcrops in the vicinity of dykes and fault zones. Likewise, intensive hydrothermal alteration and leaching processes have been observed on borehole core samples of Los Humeros. The presented multidisciplinary approach will improve the understanding of complex processes within hot unconventional reservoirs with supercritical conditions and will enable more precise reservoir models and serve as an example for upcoming projects. The supplement related to this article is available online at: https://doi.org/10.5194/adgeo-45-281-2018-supplement. We thank CFE for providing us access to the field and core storage and for their support during fieldwork and sampling. Furthermore, we thank Caterina Bianco, Thomas Kramer and Maximilian Bech for their contribution to this paper. This project has received funding from the European Union's Horizon 2020 research and innovation programme under grant agreement No. 727550. Christopher A. Rochelle publishes with the permission of the Executive Director of the British Geological Survey. We would like to thank Viktor Bruckman, Christopher Juhlin and one anonymous referee for their constructive comments. ASTM D2845-08: Standard Test Method for Laboratory Determination of Pulse Velocities and Ultrasonic Elastic Constants of Rock, ASTM, International American Society for Testing and Materials, West Conshohocken, Pennsylvania, USA, 2008. Avellán, D. R., Macías, J. L., Layer, P. W., Sosa-Ceballos, G., Cisneros, G., Sanchez, J. M., Martha Gómez-Vasconcelos, G., López-Loera, H., Reyes Agustín, G., Marti, J., Osorio, S., García-Sánchez, L., Pola-Villaseñor, A., García-Tenorio, F., and Benowitz, J.: Geology of the Pleistocene Acoculco Caldera Complex, eastern Trans-Mexican Volcanic Belt (México), J. Maps, p. 25, in review, 2017. Bär, K.: Untersuchung der tiefengeothermischen Potenziale von Hessen, Dissertation, XXVI and p. 265, 111 Fig., 28 Tab., 6 App., Technische Universität Darmstadt, Darmstadt, 2012. Canet, C., Trillaud, F., Prol-Ledesma, R., González-Hernández, G., Peláez, B., Hernández-Cruz, B., and Sánchez-Córdova, M. M.: Thermal history of the Acoculco geothermal system, eastern Mexico: Insights from numerical modeling and radiocarbon dating, J. Volcanol. Geoth. Res., 305, 56–62, 2015. 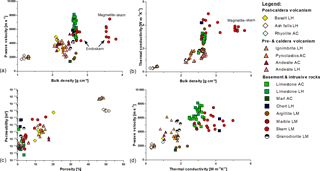 Carrasco-Núñez, G., López-Martínez, M., Hernández, J., and Vargas, V.: Subsurface stratigraphy and its correlation with the surficial geology at Los Humeros geothermal field, eastern Trans-Mexican Volcanic Belt, Geothermics, 67, 1–17, https://doi.org/10.1016/j.geothermics.2017.01.001, 2017a. Carrasco-Núñez, G., Hernández, J., De Léon, L., Dávilla, P., Norini, G., Bernal, J. P., Jicha, B., Jicha, B., Navarro, M., and López-Quiroz, P.: Geologic Map of Los Humeros volcanic complex and geothermal field eastern Trans-Mexican Volcanic Belt, Terra Digitalis, 1, 1–11, 2017b. Carrasco-Núñez, G., Bernal, J. P., Dávilla, P., Jicha, B., Giordano, G., and Hernández, J.: Reappraisal of Los Humeros Volcanic Complex by New U/Th Zircon and 40Ar/39Ar Dating: Implications for Greater Geothermal Potential, Geochem. Geophy. Geosy., 19, 132–149, https://doi.org/10.1002/2017GC007044, 2018. Clement, R., Bergeron, M., and Moreau, S.: COMSOL Multiphysics modelling for measurement device of electrical resistivity in laboratory test cell, in: Proceedings of the 2011 COMSOL Conference, Stuttgart, Germany, 2011. Ferriz, H. and Mahood, G.: Eruptive rates and compositional trends at Los Humeros volcanic center, Puebla, Mexico, J. Geophys. Res., 89, 8511–8524, 1984. GeoTEK: Multi-Sensor Core Logger, Manual, Northants, UK, p. 127, 2000. GeoTEK: MSCL-S: Multi-Sensor Core Logger, http://www.geotek.co.uk/products/mscl-s/, last access: 26 May 2018. Geotron-Elektronik: LightHouse UMPC V1.02 Installations- und Bedienungshandbuch, 1.6, Geotron-Elektronik, Pirna, 2011. Hornung, J. and Aigner, T.: Sedimentäre Architektur und Poroperm-Analyse fluviatiler Sandsteine: Fallbeispiel Coburger Sandstein, Franken, in: Hallesches Jahrbuch für Geowissenschaften, Reihe B, Beiheft 18, University of Halle-Wittenberg, Halle (Saale), 121–138, 2004. Huenges, E.: Geothermische Stromerzeugung – Grundstrom für den erneuerbaren Energiemix 2050, FVEE Themen 2010, 73–76, 2010, in: Tagungsband 2010: Forschung für das Zeitalter der erneuerbaren Energien, ForschungsVerbund Erneuerbare Energien, Renewable Energy Research Association, Berlin, Germany, p. 148, 2010. ISRM: Suggested methods for determining water content, porosity, density, absorption and related properties and swelling and slake-durability index properties, Int. J. Rock Mech. Min. Sci. Geomech. Abstr., 16, 143–151, 1979. Jolie, E., Bruhn, D., López Hernández, A., Liotta, D., Garduño-Monroy, V. H., Lelli, M., Páll Hersir, G., Arango-Galván, C., Bonté, D., Calcagno, P., Deb, P., Clauser, C., Peters, E., Hernández Ochoa, A. F., Huenges, E., González Acevedo, Z. I., Kieling, K., Trumpy, E., Vargas, J., Gutiérrez-Negrín, L. C., Aragón-Aguilar, A., Halldórsdóttir, S., González Partida, E., van Wees, J.-D., Ramírez Montes, M. A., Diez León, H. D., and the GEMex team: GEMex – A Mexican-European Research Cooperation on Development of Superhot and Engineered Geothermal Systems, SGP-TR-2013, in: Proceedings 43rd Workshop on Geothermal Reservoir Engineering, 12–14 February 2018, Stanford University, Stanford, California, p. 10, 2018. Lepillier, B., Bakker, R., and Bruhn, D.: Characterization of a fracture-controlled enhanced geothermal system (EGS) in the Trans-Mexican-Volcanic-Belt (TMVB), Predictive mechanical model for fracture stimulation in an enhanced geothermal system context(EGS), in: 9th European Geothermal PhD Days, 14–16 March 2018, Zurich, Switzerland, 2018. Lippmann, E. and Rauen, A.: Measurements of Thermal Conductivity (TC) and Thermal Diffusivity (TD) by the Optical Scanning Technology, Lippmann and Rauen GbR, Schaufling, Germany, 49 pp., 2009. López-Hernández, A., García-Estrada, G., Aguirre-Díaz, G., González-Partida, E., Palma-Guzmán, H., and Quijano-Léon, J.: Hydrothermal activity in the Tulancingo-Acoculco Caldera Complex, central Mexico: Exploratory studies, Geothermics, 38, 279–293, https://doi.org/10.1016/j.geothermics.2009.05.001, 2009. Micromeritics: AccuPyc 1330 Pycnometer, V2.02, Part No. 133-42808-01, Micromeritics GmbH, Munich, Germany, 67 pp., 1997. Micromeritics: GeoPyc 1360, V3, Part 136-42801-01, Micromeritics GmbH, Munich, Germany, 69 pp., 1998. Mielke, P., Bär, K., and Sass, I.: Determining the relationship of thermal conductivity and compressional wave velocity of common rock types as a basis for reservoir characterization, J. Appl. Geophys., 140, 135–144, https://doi.org/10.1016/j.jappgeo.2017.04.002, 2017. Norini, G. Gropelli, G., Sulpizio, R., Carrasco-Núñez, G., Dávila-Harris, P., Pellicioli, C., Zucca, F., and De Franco, R.: Structural analysis and thermal remote sensing of the Los Humeros Volcanic Complex: Implications for volcano structure and geothermal exploration, J. Volcanol. Geoth. Res., 301, 221–237, 2015. Pfeiffer, L., Bernard-Romeo, R., Mazot, A., Taran, Y. A., Guevara, M., and Santoyo, E.: Fluid geochemistry and soil gas fluxes (CO2-CH4-H2S) at a promissory Hot dry Rock Geothermal System: The Acoculco caldera, Mexico, J. Volcanol. Geoth. Res., 284, 122–137, 2014. Pinti, D.L., Castro, M. C., Lopez-Hernandez, A., Han, G., Shouakar-Stash, O., Hall, C. M., and Ramírez-Montes, M.: Gluid circulation and reservoir conditions of the Los Humeros Geothermal Field (LHGF), Mexico, as revealed by a noble gas survey, J. Volcanol. Geoth. Res., 333–334, 104–115, 2017. Popov, Y. A., Sass, P. D., Williams, C. F., and Burkhardt, H.: Characterization of rock thermal conductivity by high resolution optical scanning, Geothermics, 28, 253–276, https://doi.org/10.1016/S0375-6505(99)00007-3, 1999. Popov, Y. A., Beardsmore, G, Clauser, C., and Roy, S.: ISRM Suggested Methods for Determining Thermal Properties of Rocks from Laboratory Tests at Atmospheric Pressure, Rock Mech. Rock Eng., 49, 4179–4207, https://doi.org/10.1007/s00603-016-1070-5, 2016. Reinsch, T., Dobson, P., Asanuma, H., Huenges, E., Poletto, F., and Sanjuan, B.: Utilizing supercritical geothermal systems: a review of past ventures and ongoing research activities, Geoth. Energy, 5, 25, https://doi.org/10.1186/s40517-017-0075-y, 2017. Romo-Jones, J. M., Gutiérrez-Negrín, L. C., Flores-Armenta, M., del Valle, J. L., and García, A.: 2016 México Country Report, IEA Geothermal, p. 7, 2017. The here submitted paper represents the first results of a larger project named GEMex . The objective of the project – a Mexican–European cooperation – is to explore the geothermal potential of deep unconventional systems like enhanced geothermal systems (EGS) and super-hot geothermal systems (SHGS). New exploitation approaches and technologies are being developed, allowing the use of geothermal resources under challenging technical demands.